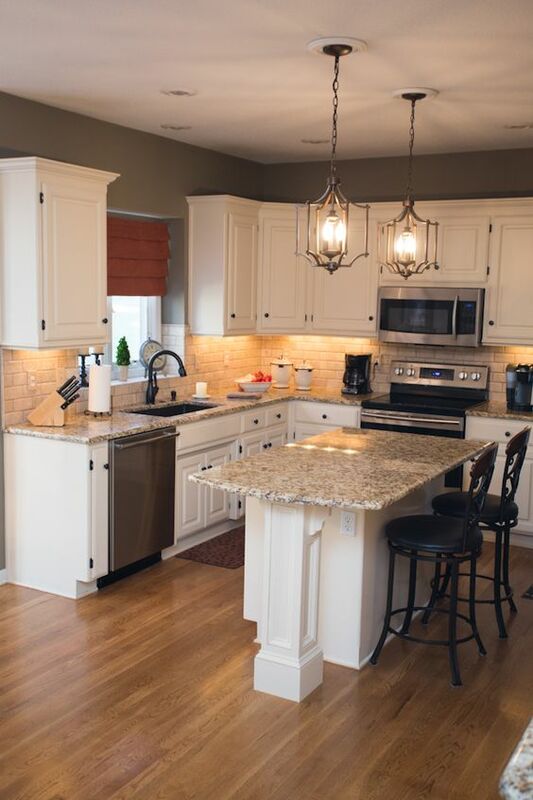 Giallo Ornamental Granite made this kitchen a warm and welcoming space. 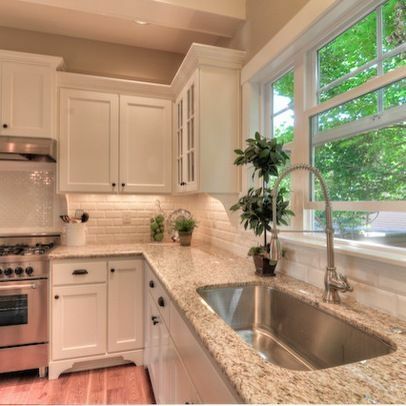 This light colored granite makes any space feel bigger. Its rich and classic look adds luxury as well as the feeling of openness and airiness. With its natural design, the choice of cabinet colors with these countertops is endless. However, dark kitchen cabinets were the right choice for this cooking space, because of this amazing contrasting effect. Giallo Ornamental Granite comes from a bedrock located in the northern part of Espirito Santo in Brazil. This stone is one of the larger quarries. It produces more than one hundred truckloads per month. It is occasionally called Giallo Santo granite, Amarello Ornamental, or Giallo Ornamentale. This is an off-white patterned and textured stone with medium brown speckles and veins. From afar, Giallo Ornamental kitchen countertop looks uniform with its overall characteristic creamy color. From up close, it can be seen that the bedrock of the stone is actually white. This white shade slightly varies from pure white to a light gray. The stunning color of this amazing stone comes from the plethora of golden minerals. These minerals usually have a lovely light cream color. Occasionally, they can also have a darker shade as a light honey color. Dotted around the stone is actually a wealth of dark brown minerals. Depending on a slab, some can have a more golden bedrock. Others have a creamy bedrock. Many decide to use Giallo Ornamental Granite in their kitchen because this stone possesses all the colors and shades that make it a great match for any room. An extensive color range, from light and white to gray, and from yellow to beige, is very convenient to match with any of the color schemes in any kitchen or bathroom. Giallo Ornamental is a natural stone. As such, it’s recommendable to be sealed once a year in order to extend its longevity. It is beautiful, weather resistant and durable. This is why it’s a good material for outdoors as well as for indoors. 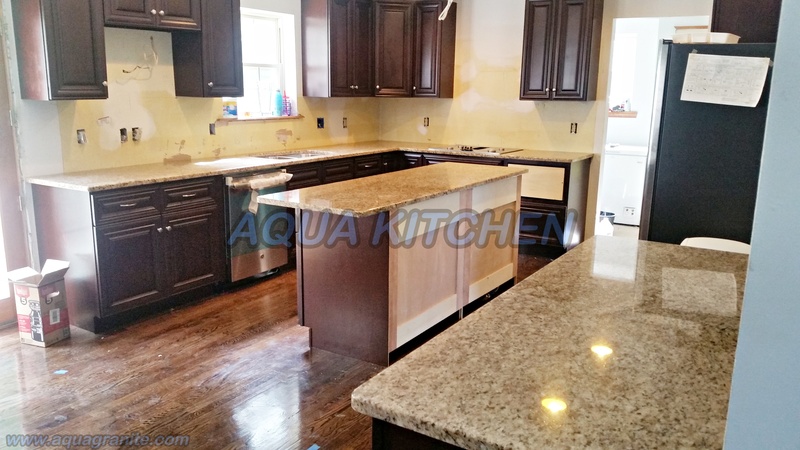 This granite is a safe bet because it’s durable and needs the minimum of maintenance. Giallo is well suited to rooms both with and without much natural light. It will hide fingerprints thanks to its light color. Giallo Ornamental Granite is a light colored countertop – amazingly versatile and often the final piece, one that completes many kitchen designs, from classic and cozy, to modern and sleek. There are also other light granite countertops, completely unique and capable of transforming your kitchen design into a work of art you always desired in your home. Durable, stain resistant and easy to maintain, granite countertops are the perfect solution for your kitchen. Whether you live in Saylorgsburg or any of the neighboring places like Wind Gap, Gilbert or Bartonsville, take a look at our granite countertop selection. Everything in our showroom is also available to you.